Monster of Elizabeth Lake, Los Angeles County, California? Home | All Almanac Topics | Mysterious L.A.
Elizabeth Lake in the Angeles National Forest, 2008. Photo by Kfasimpaur, posted in Wikimedia Commons. Editor's Note: the Almanac includes the following as folklore - not history. 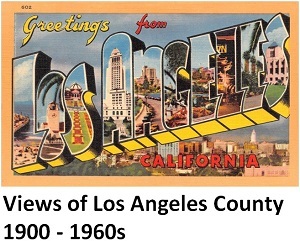 Although some elements of the story may indeed be historical fact, we offer these stories as a part of the cultural fabric of Los Angeles County. Legend has it that a monster lived in Elizabeth Lake (17 miles west of Palmdale on Elizabeth Lake Road). Early Spanish settlers supposedly told stories that the Devil himself created the lake and kept one of his pets in it. One of the earliest recorded stories from the 1830s recounted that Don Pedro Carrillo abandoned a ranch on the lakeshore after structures on the property were destroyed by a mysterious fire. He complained of La Laguna del Diablo, as the lake was named prior to 1834. In 1855, American settlers tried moving into the area, only to later abandon it with complaints of disturbing and unnatural nocturnal noises and sightings. Not long afterward, rancher and new owner Don Francisco "Chico" López (after whom the lake came to be named Laguna de Chico López), range boss Chico Vasquez, and Don Guillermo Mentiroso claimed to witness at the lake “a huge monster, larger than the greatest whale, with enormous bat-like wings…. It would roar and splash the water with what appeared to be great flippers or legs.” Lopez subsequently also abandoned the lakeside property, claiming that his livestock were vanishing. In 1886, another rancher, Don Felipe Rivera, claimed to see a 45-foot beast at the lake that tried to eat one of his steers. Rancher Miguel Leonis, who subsequently acquired the land, reported his own encounter with a griffin-like creature at the lake. Upset with disappearing livestock, Leonis claimed to lay-in-wait for the creature one night and attacked and injured it, which he believed caused it to flee the area. Portrait of rancher Miguel Leonis. Courtesy of the California Historical Society Collect & USC Libraries. Leonis was the last to report any sightings of a creature at Elizabeth Lake. The story, however, went on to say that a creature of similar description began appearing in Arizona where it was ultimately killed. Map showing location of Elizabeth Lake in Los Angeles County. Descriptions of the creature are close to that of the legendary Thunderbird commonly found in Native American mythology. Some suggest that, had a large flying creature actually been seen at Elizabeth Lake, it may have been the California Condor, although such a bird, even with a wingspan up to 9.5 feet, does not seem as enormous a creature as described in Elizabeth Lake lore. A waterbourne ceremony in British Columbia by Kwakiutl people featuring a masked portrayal of the Thunderbird, circa 1914. Photo by Edward S. Curtis, courtesy of the Library of Congress. California Condor. Courtesy of U.S. Fish and Wildlife Service, Sacramento Office.